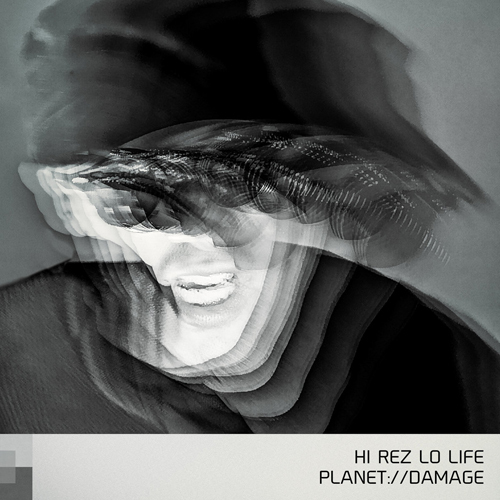 Eastern European cyberpunk/industrial artist Planet://Damage has released a new four track EP, Hi Rez Lo Life, on Angelspit’s Black Pill Red Pill imprint. Mixed, mastered, and produced by Krisztián Árvai of Black Nail Cabaret, the stompy dance floor friendly EP is described by the artist as “both a reminder and a warning” that “humanity’s greatest potential is a greasy burp of couch crisps and a complaint against bad CGI when an actual extra-terrestrial invasion goes live on social media.” An accompanying music video for the title track by visual artist Richard Besenczi, who also shot Planet://Damage’s previous video “Vex,” draws inspiration from the glitchy, retro monochrome aesthetic of ’80s and ’90s European videos, anime, and surveillance culture. Máriusz Bari – a.k.a. Damage – is extremely active in the cyberpunk and industrial scenes, writing alternative fanzine The Dose and the book Damage Report. He also works as a producer, having collaborated with Emke from Black Nail Cabaret, and been remixed by artists including Haujobb, Leæther Strip, and Attrition.